Waiting For The Train, Oaxaca Train Station, Oaxaca, Mexico, 1990 by Philip Hyde. Never before printed or published. 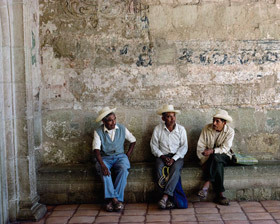 Philip Hyde’s “Waiting For The Train, Oaxaca Train Station, Oaxaca, Mexico” photographed in 1990 will be part of the “Pioneer Photography of Philip Hyde Exhibition at Mountain Light Gallery” in Bishop, California opening May 8 and running through August 31, 2010. (See also the announcing blog post, “Photography Of Philip Hyde At Mountain Light Gallery” and the related blog post, “Galen Rowell, Philip Hyde And Outdoor Photographer Style.”) The people photograph, “Men of Oaxaca” breaks the pattern of the typical Philip Hyde landscape photograph. 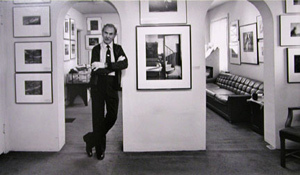 Philip Hyde made a good number of people portraits but rarely published or printed them. “Waiting For The Train, Oaxaca Train Station” is also unusual for Philip Hyde in that it was photographed with a 35 mm camera. While “Waiting For The Train” can be viewed on the Philip Hyde Website, several other new releases in the exhibition are not even on the website yet and have not been printed or published for many years or ever. 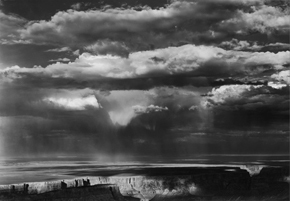 One release that is new to archival fine art digital prints is a 1968 photograph called, “Base of Havasu Falls, Havasupai Indian Reservation, Arizona.” Philip Hyde made only two dye transfer prints of this image that are long gone. It was never publicly exhibited as far as the records show. This will be the first gallery exhibition for this photograph. The restoration of this image was very time-consuming because the original Kodak E-3 transparency has deteriorated significantly. The raw drum scan of the original transparency had an orange-magenta caste overall with concentrated streaks, fingerprints and other blotches in the water throughout. Carr Clifton spent over 10 hours working on this one photograph. His process I will write up in another blog post, but suffice now to say that it involved a complex combination of the lasso tool, hue, saturation, color adjustment, color balance, select color, edit-fill, and several other general tools in Photoshop to get all of the flaws out and make the white water look right. Another photograph that will appear in the Mountain Light Gallery Exhibition that Philip Hyde never printed but that was published by the Sierra Club is “Mt. Jefferson, Jefferson Wilderness Area, Oregon Cascades, Oregon” made in 1959. 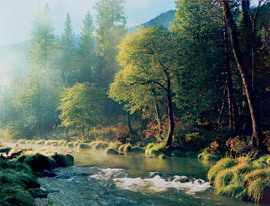 This photograph the Sierra Club published as a beautiful postcard in 1961. The original transparency and drum scan of it show large, dark forested areas. 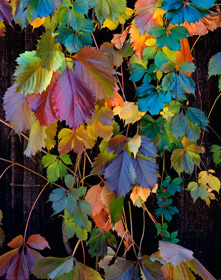 In the digital age, we were able to lighten the nearly black forests without changing the character of the photograph. As an archival fine art digital print this image has become more beautiful than ever. The lightening of the dark areas has brought out remarkable features in the finished print that could never have been achieved with any older printing process. 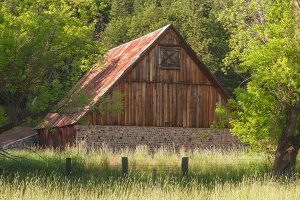 Philip Hyde had a packer guide he and Ardis Hyde’s gear into the Jefferson Wilderness Area by horseback, while Ardis and Philip Hyde hiked in on foot. Philip Hyde went in to get photographs of the Jefferson Wilderness Area because it had been part of a proposed Oregon Cascades National Park that had some renewed interest in 1959 but not enough to go beyond speculation. 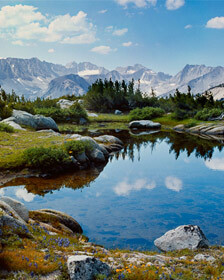 Pioneer Basin, Fourth Recess, John Muir Wilderness, Sierra Nevada High Country, California, 1970 by Philip Hyde. Never before printed or published. Philip Hyde photographed “Pioneer Basin, Fourth Recess, John Muir Wilderness, Sierra Nevada High Country, California” in 1970. This beautiful photograph sat in the files and was never published or printed. In 2008 it was drum scanned and sat in digital form for another year and a half. Finally near the end of 2009, in search of more good California photographs, particularly of the High Sierra, and considering another image of Kearsarge Lake, I showed “Pioneer Basin, Fourth Recess” to Carr Clifton and he agreed that it ought to be prepared for printing. We printed an 8X10 proof that needed work. Carr Clifton is the Photoshop genius, but I sit in with him sometimes and make suggestions. We at times disagree, but that makes for good discussions and usually better results. I greatly respect him and his photography and he respects my work ethic and how dedicated I am to doing what my father would like. In the case of “Pioneer Basin, Fourth Recess” after we fixed a few technical problems and made another 8X10, it turned out beautifully. Then we printed an 11X14, Wow. We were so enthused about the image that I decided to put it in my 11X14 portfolio book that I take everywhere to show. I decided that we had to print a 16X20 and put it in the Mountain Light Gallery Exhibition. I put it on the website for a while but took it down to await a special announcement like this. The three new releases that are not yet up on the website will remain off the website and only viewable at Mountain Light Gallery until the exhibition is over at the end of August. In addition to the four prints mentioned above that will be completely new, the exhibition will include 14 images that have never been exhibited before this Century. 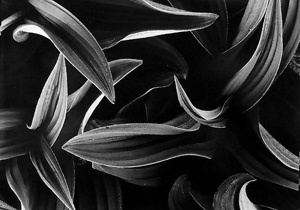 That makes 18 new prints that will be shown for the first time since Philip Hyde passed on. Besides new prints, the Mountain Light Gallery Exhibition will include an original black and white silver print of Philip Hyde’s iconic “Minarets From Tarn Above Lake Ediza, Ansel Adams Wilderness, Sierra Nevada, California, 1950.” This photograph of the Minarets Ansel Adams said he liked better than his own. Also in the show will be an original color Cibachrome print of “Ice On Continental Divide, Yoho National Park, British Columbia, Canada, 1992.” This newer Canadian Rockies image is of sheer rock peaks with forested foothills. Come see all of the new imagery. 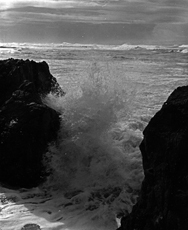 Read a Recent Interview of me by Richard Wong regarding my work with Philip Hyde Photography: Son of Environmental Photography Pioneer David Leland Hyde Interview.